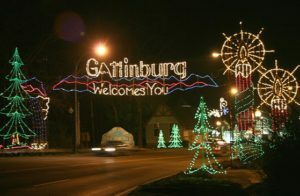 Was I tough enough to visit Gatlinburg right after the fire? I wasn’t so sure. I’d watched endless footage of the devastation on TV. I’d seen with my own two eyes dozens of burned-down homes in Wear’s Valley as I drove, a couple of weeks ago, from Knoxville to a rental cabin in the Smokies. A cabin my kids and I hoped would be the perfect place for our growing family—which includes five children under the age of five–to eat, sleep, play and celebrate an early Christmas together. Little did we know that fire would ravage our beautiful Smoky Mountains just days before we were to arrive. When we learned that the cabin had escaped damage, we decided to proceed as planned. Determined to create wonderful memories in spite of the disaster, we walked in the woods and worked puzzles and played air hockey and read lots and lots of books. We had a blast at Dollywood despite the cold temperatures. But when daughter-in-law Natalie suggested visiting Gatlinburg when it re-opened on December 9, I was hesitant. “It might be too sad,” I said. “They say the best way to help Gatlinburg is to spend money in Gatlinburg,” she countered. So we piled into our cars and went. The first heartbreaking sight we came upon was the charred remains of the Alamo Steak House. The marquee near the street–# 1 ON TRIP ADVISOR, it said–was all that was left. Ruined cars and trucks littered the roadsides heading into town. Burned buildings were nothing but concrete block and ashes. But here’s the weird thing. The destruction was eerily random. Within spitting distance of a destroyed motel was a motel that was just fine. A stone’s throw from burned-down cabins were intact cabins. On either side of a blackened strip of forest were unscathed trees and shrubs, testimony to the whims of the ferocious winds and the tireless effort of those who fought the monstrous blaze. On Gatlinburg’s main strip, it was business as usual. Almost, anyway. Restoration-and-Clean-up trucks were everywhere, as was yellow police tape. The Skylift was still standing but not operable. Far too many of the locals’ faces failed to hide the battle-weariness behind the smiles. But fearless pigeons still pecked at crumbs on the sidewalk. The salt water taffy machine did its thing in the window of Old Smoky Candy Kitchen. The gigantic T-Rex was still busting through the roof of Ripley’s Moving Theatre. And the Gatlinburg Convention Center was open for business. WE ARE MOUNTAIN STRONG its sign said. Best of all, on the outdoor speakers that broadcast music up and down the street, Alabama sang “Tender Tennessee Christmas.” Which just might be my favorite holiday song in the whole wide world. Gatlinburg is bruised and battered, but it’s not broken. For that I’m thankful. And I’m thankful that I got to spend a little bit of my Christmas in that special place.